A new year is the perfect opportunity for you to start fresh and get all of your tasks organised! With our free printable desk planner, it couldn’t be easier! We have two, free desk planners for you to choose from! Which is your favourite? Download your free weekly desk planner templates here! Your Weekly Planner features each day of the week alongside a ‘This Week’s goals’ and ‘Notes’ section to help you write your to do lists! Nothing is more satisfying than crossing off a task from your list. Why not jazz up your planner with Washi Tape to separate lists and give it a burst of colour? The fun, patterned designs will really brighten up your desk! Colour coordinating your lists is another great way of managing your tasks! Not only will it help you figure out what your priority is but your notes will look super pretty! Each day, set yourself the task of completing your top 5 goals! Lists may seem overwhelming but if you make it doable, you’ll be crossing each task off in no time! To keep on top of your month’s worth of shopping lists, craft projects and appointments, we suggest printing out 4 of these templates so you can write in reminders throughout the month! You could also print a separate weekly planner for different aspects of your life. You could have a work schedule, a crafting schedule etc. 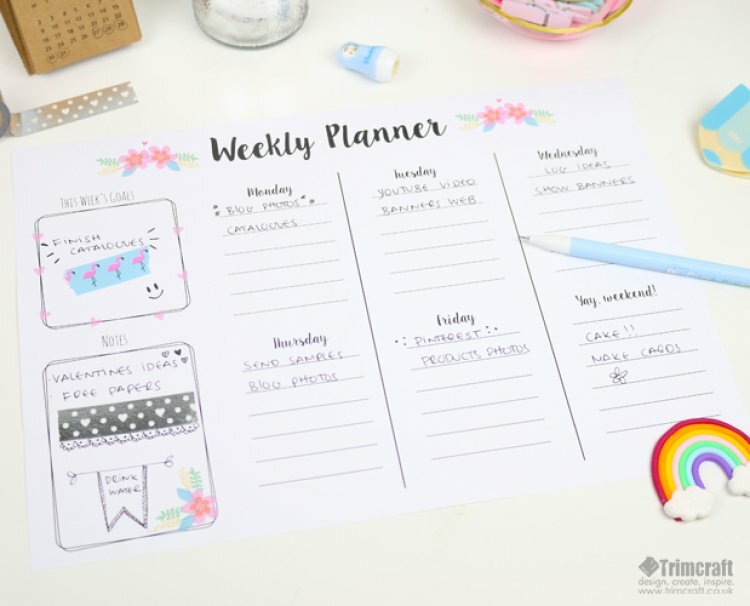 This desk planner is such a time saver and you won’t believe how useful it will be to have by your side! Better yet, you can personalise it with stickers and doodles to really make it your own! Don’t forget to upload your fabulous makes to the inspiration area and to #trimcraft when uploading to social media!